Room, Officers’, for the use of. Sometimes I feel like a third wheel at Rev War events. There is not always a lot for women to do besides chores, and the public often ignore us. Still, there is one maxim I know to be true: if you’re bored, work. Thus, when I found myself drifting off Saturday, I started dinner. The best part was where I got to make dinner: in a chamber off the main room of the Temple at the New Windsor Cantonment. These two rooms were occupied by the 10th Mass this year. Last year, the unfinished room had been the scene of Dirt Stew. Cutting vegetables on a table was a major upgrade; last year, I think I used the kettle lid, the floor being too gritty even for me. It’s End of Stored Root Vegetable season here, so largish carrots and parsnips went into the pot, along with potatoes, onions, and a cooked chicken disjointed by hand (a task I have experience in). This year, we brought the only iron we own, a small trivet-like stand to put the big kettle on; the little one went on bricks from the Temple’s other fireplace. Was that slim piece of iron wrong? Probably, but in a place where we can’t dig a kitchen or make a fire outdoors, we compromised in the name of keeping supper unspilled. Why no fires outdoors? Red flag warnings, due to high winds and low RH. That all hobbies will be affected by climate change was clear on Saturday, as we discussed invasive species, transporting wood across state lines, and various site rules on using brush to build shelters. It’s not just about digging fire pits or kitchens and archaeology anymore. Kirsten, could you please explain for the uninitiated why ironware turns out to be wrong for this period? Was it too heavy to carry on campaign? It never would have occurred to me that ironmongery was wrong, and I’m very curious as to why, since I’ve seen it come up a few times as topic here! Don, this is hot topic in the BAR, even now. Granted, that’s the 40th, and not Continental troops. Another good source is here: https://www.scribd.com/doc/229610630/As-many-fireplaces-as-you-have-tents-Earthen-Camp-Kitchens with excellent illustrations of the three sticks- one kettle-no matches routine. As nominal Light Infantry, we should carry less than we often do, but in this instance, we opted to bring a folding stand, made even worse by the “India” mark on one of the cross pieces. However, we did *not* dump the kettle. We had expected to cook in the fireplace without andirons, and we could have used the andirons themselves if we’d been more clever. For an American reference to dumping equipment, Joseph Plumb Martin refers to dropping a kettle, which is at least one documented example of weight as a factor. Even with Plumb Martin’s obvious textual issues, that seems a pretty straightforward story, though it certainly refers to the general difficulty of supplying an army. I will admit to not deeply searching for ironware in images, but I think there are a few. I can think of one which shows a tripod, though that may be of wood. A tall tripod. Having used such a thing for laundry elsewhere, I can confirm that wood too close to a fire will ultimately burn and fail. Thanks, Kirsten, for that very thorough and interesting reply! Ah, I am so grateful, indeed, to interpret a household/village setting rather than a military one! 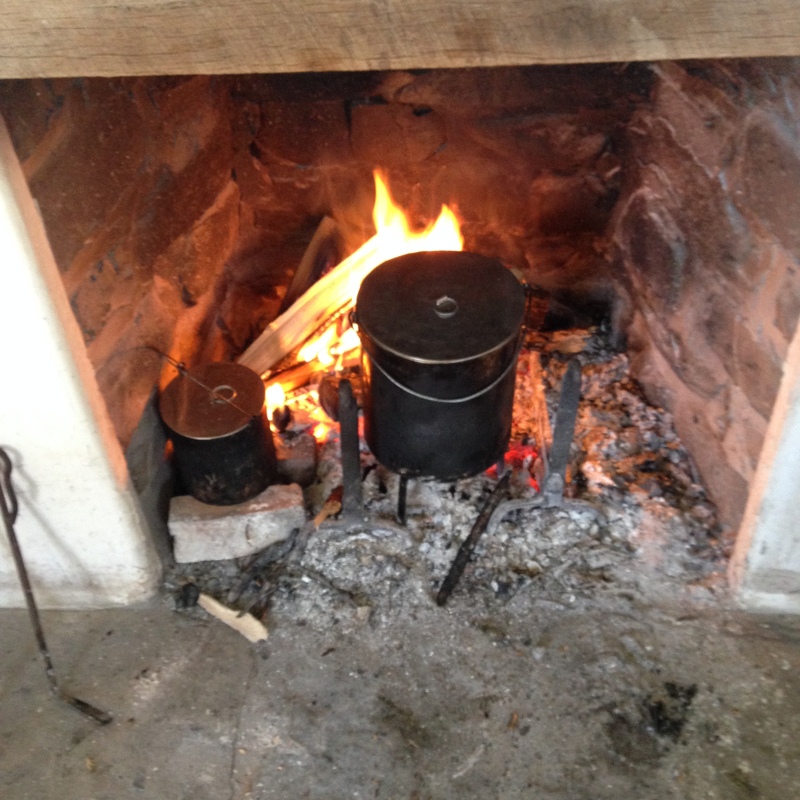 Still, I suspect that we could be doing much more for the quality and authenticity of our hearth cooking. Sadly, the classes are so darn far away! Anyone have great references on period storage and preservation of food in households (rather than while on the move)? “Period” meaning, for me, anything up to about 1820. The cookbooks of the time might help you, from Amelia Simmons and on to The Frugal Housewife, but I think it really matters what specifically you want to know. Recipes? Objects? Local produce? The Salt Water Foodways book (http://www.amazon.com/Saltwater-Foodways-Sandra-L-Oliver/dp/0913372722) is one we use out here, but I know you aren’t here, and location is everything. My best guess is that the answer will be both specific and general: most recipes/receipts across the Atlantic and this continent seem to have their origin in Hannah Glasse and the other early English cookbooks; that’s what Williamsburg’s historic food blog can be a helpful place to start for me, and for you, too. But recipes will be adapted to local climatic and crop conditions, further modified by cultural overlap. 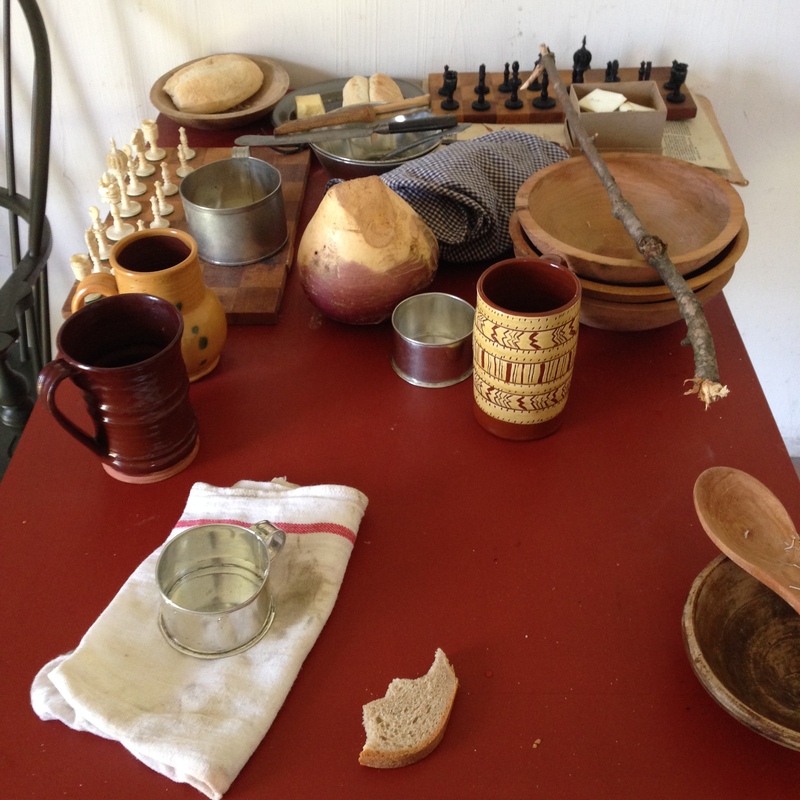 The native people of the midwest have somewhat different food traditions than the Algonkian people here; up the Mississippi River valley, the French will influence cooking and storage in a way that won’t be seen here. And I guess I digressed more than meant to…without actually answering! Kitty, you always have wonderful, thoughtful responses…and more often than not remind me of what I have in my own backyard (MoHist)! More than recipes, I’m digging for general storage techniques, though recipes for pickling or potting will help. The answer to all food safety today is to put it in the refrigerator, but that really doesn’t help at all. And isn’t always correct. My grandmother did not store her butter in the refrigerator, and it did not go rancid. We have, as a culture, forgotten how to keep our food without refrigeration (and without giving ourselves botulism).